A dislocated patella can occur with many different types of sports activities, including contact sports like football and rugby, or non-contact sports like basketball and soccer. A patellar dislocation is a significant injury that must be treated correctly for a full recovery. A dislocated patella can occur either with a forceful blow to the patella or from a twisting of the knee. Almost all patellar dislocations occur laterally - this means that the patella dislocates toward the outside of your knee. If you play a contact sport, you can suffer a dislocated patella if someone hits the inside of your knee, forcing the patella to move too far to the outside. This is not a very common way for this injury to occur, but it can happen. 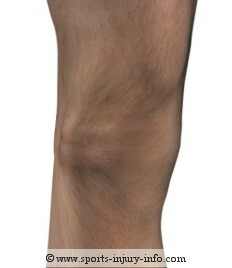 More common is a twisting of the knee that causes the patella to dislocate. 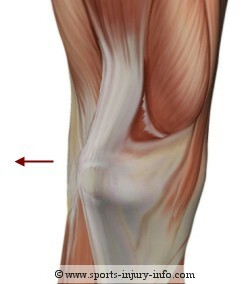 Remember the quadriceps muscles all attach to the patella. If these mucsles contract forcefully while the knee is twisting, they can actually pull the patella out of its normal groove. One of the most common ways a patella dislocation occurs is landing on the knee awkwardly, with a sudden bending and twisting motion. This combination of bending and twisting causes the patella to dislocate. The most obvious sign of a patellar dislocation is the defromity. If your knee is bent, the patella will actually be toward the outside of your knee. It will usually return to its normal place if you straighten the knee out. Sometimes deformity is not noticible, especially if the patella dislocates and then returns back to its groove right away. 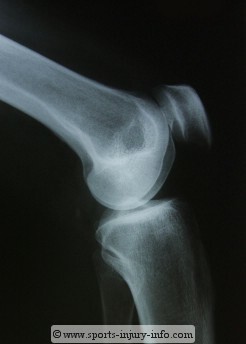 Pain and swelling are other symptoms of patella dislocation. You will usually have pain along the inside of your knee, especiall along the patella. This is where the damage to the tissues occurs. Your knee will swell up all around the patella, usually within the first few hours after injury. Popping or feelings of instability are also common with patellar dislocations. If you suffer a patellar dislocation and your patella is out of place, the first thing that you should do is to slowly and gently straighten out your knee. This will cause the patella to return to its normal position and will decrease your pain almost immediately. Once your dislocation is reduced, you should see your physician as soon as you can to have an X-ray. Fractures are not common with this injury, but when the patella dislocates, it can damage the bone when it moves out of or back into the groove. Use the R.I.C.E. principles for the first few days after injury. Try to keep it elevated, rest, and use ice and compression to help control your swelling. Using a knee brace for the first 2-3 weeks is also important so that it limits the stress on the damaged tissues. Your doctor may give you a straight leg brace, or a patellar stabilizer. Follow your physicians instructions so that your patella and the damaged tissues will heal correctly. Patella dislocation is one injury that needs supervised rehabilitation for the best recovery. After your injury, you will have a lot of swelling and pain, as well as decreased range of motion and strength. All of these problems need to be addressed. Rehabilitation with a physical therapist or athletic trainer will give you the best chance for a full recovery, and it will significantly decrease the chance of dislocating again. Your rehab should focus on improving your strength in your quadriceps, hamstrings, hips and core, as well as restoring your range of motion. Most patellar dislocations take awhile to heal. The first 3-4 weeks are a protective phase to allow the tissues to heal and tighten down. After that, strengthening can progress. You should be back to normal in 3-5 months after your injury. Some patellar dislocations may require surgery to re-align the patella or to repair the damaged tissues. Surgery is usually not performed unless conservative rehabilitation fails. A dislocated patella is a serious sports injury that needs to be treated by a sports medicine professional for the best recovery. 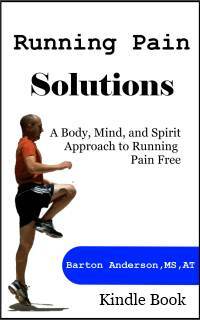 Intial treatment focuses on the R.I.C.E. Principles as well as using a brace to protect the damaged tissues. Rehabilitation will last for 2-3 months after injury, and you should be able to return to sports in 3-5 months. If conservative treatment fails, you may require surgery.